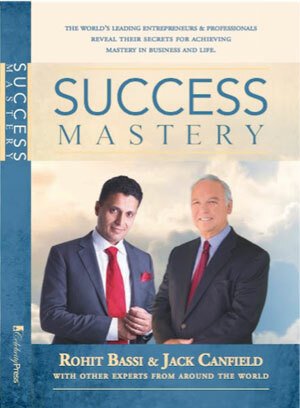 A portion of the royalties earned from Success Mastery will be donated to Entrepreneur’s International Foundation, a not-for-profit organization dedicated to creating awareness for charitable causes. All of this makes him an asset to the publication and will surely benefit a wide range of readers. 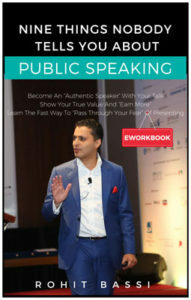 Become an “authentic speaker”, “pass through your fear” and “earn more”! 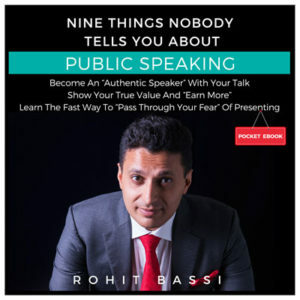 Get your FREE guide Nine Things Nobody Tells You About Public Speaking Pocket Ebook and Eworkbook. Rohit Bassi is a pro-active and highly engaging speaker who inspires you through the power of awareness, consciousness and energy. He is a passionate trainer, coach and facilitator in the areas of presentation skills, leadership and management, sales and business development, communication skills and customer service. His work is about growing from the inside out and being practical in this hectic world we live in. For him this means to connect with your own inner self to bring balance and integration to outperform yourself. Supported numerous businesses spread across 40 countries. He is committed to adding value to you using his extensive years of international experience from UK, Afghanistan, Congo, Ireland, France, Australia, America, Philippines, India, Kenya and all through the Middle East. Rohit has delivered sessions to the likes British Gas, Nielsen, KPMG, PwC, YouGov, Cadbury Schweppes, BAA, Eurostar, Oracle, EMC, VMware, HSBC, Emirates NBD, Abu Dhabi Terminals, Harley-Davidson, Emaar Hospitality, Jumeirah, Marriott, Harrods, DP World and many more.